Dedicated in 1938, the chapel hosts approximately 1,000 events annually including religious services, weddings, classes, lectures, concerts, memorial services, and guided tours. between Fifth and Forbes Avenues, Pittsburgh, Pennsylvania 15260. 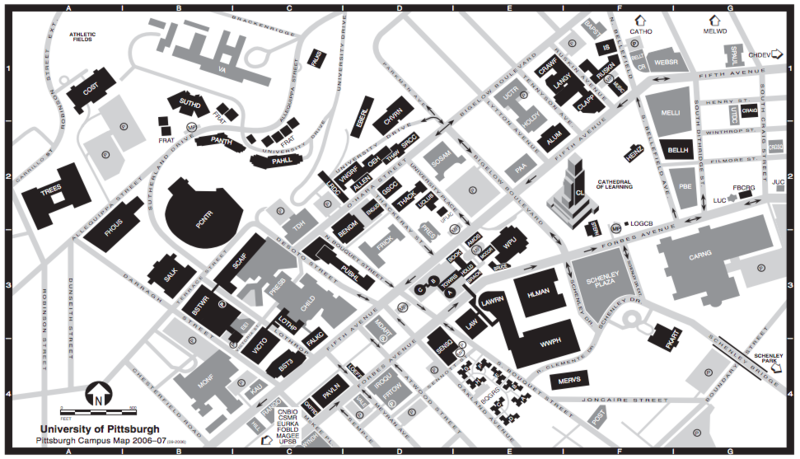 View the University of Pittsburgh's campus map here. Take Exit 57 (Pittsburgh) to I-376 West, then Exit 73b (Oakland). Merge onto Bates Street. Make a left onto Bouquet Street, a right onto Forbes Avenue, and a left onto South Bellefield Avenue. Take Exit 28 (Cranberry) and follow I-79 South to I-279 South. Follow I-279 South, then take exit 2A to merge onto I-579, Veteran's Bridge. Take exit to I-376 East/Oakland/Monroeville, merge onto Boulevard of the Allies, exit onto Forbes Avenue, then make a left onto South Bellefield Avenue. Take I-79 South to I-279 South. Follow I-279 South, then take exit 2A to merge onto I-579, Veteran's Bridge. Take exit to I-376 East/Oakland/Monroeville, merge onto Boulevard of the Allies, exit onto Forbes Avenue, then make a left onto South Bellefield Avenue. Take the Route 28 exit 6 onto Highland Park Bridge to Washington Boulevard. Follow onto Fifth Avenue. Make a left onto Morewood Avenue, a right onto Forbes Avenue, and a right onto South Bellefield Avenue. Take I-79 North, take exit 59A to merge onto I-376 East toward Pittsburgh. Follow I-376 through the Fort Pitt Tunnel and across the bridge (slight right to stay on I-376 East (Monroeville). Exit onto Forbes Avenue, then make a left onto South Bellefield Avenue. Underground parking is available below Soldiers & Sailors Memorial Hall & Museum, 4141 Fifth Avenue. There is also metered street parking along Bellefield Avenue and other side streets around the University of Pittsburgh campus. There are two accessible parking spaces adjacent to the chapel on South Bellefield Avenue (Note: You must have the designated plate or hang tag to park in these spaces). From Fifth Avenue in Downtown Pittsburgh, take Bus 61 (A, B, C, or D) or 71 (A, B, C or D). More information about Bus transportation may be obtained from the area Port Authority. Weddings booked at Heinz Chapel include reserved parking on the left hand side of South Bellefield Avenue (a one way street). There is room for 45 to 50 cars and a uniformed Pittsburgh Police Officer will be present to supervise. Parking times coincide with the time each bridal party has access to the chapel (see Schedules).